A phone is an important thing of your life. In fact, every time you’re using them and saving it so that you don’t lose them. But if I lose my content from my phone the only thing I would be thinking of is my memories of photos & videos and you might be the same. 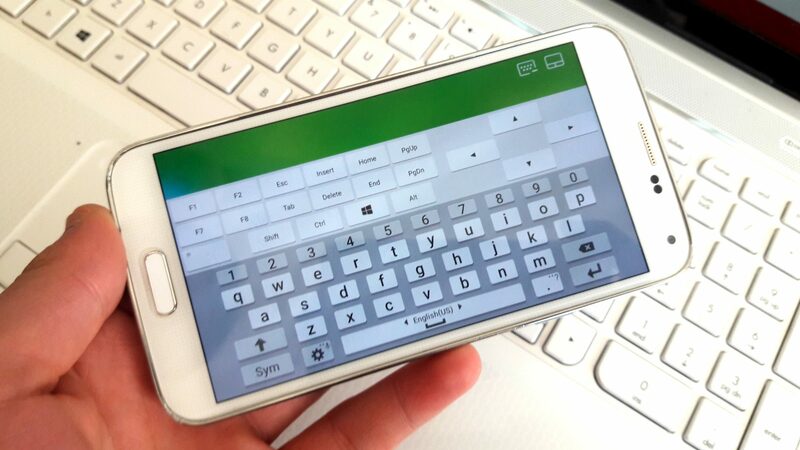 Or, if you have got 16GB or 32GB phone, then you’ll be counting every KB included. Thus, you would be afraid of recording or taking pictures often, while they are the heart of a phone like the heart of ocean in Titanic. No worries, because we have got the solution of your problems whether its storage or backup. In this article, we will be showing you the solution of your problems and working with Google Backup. 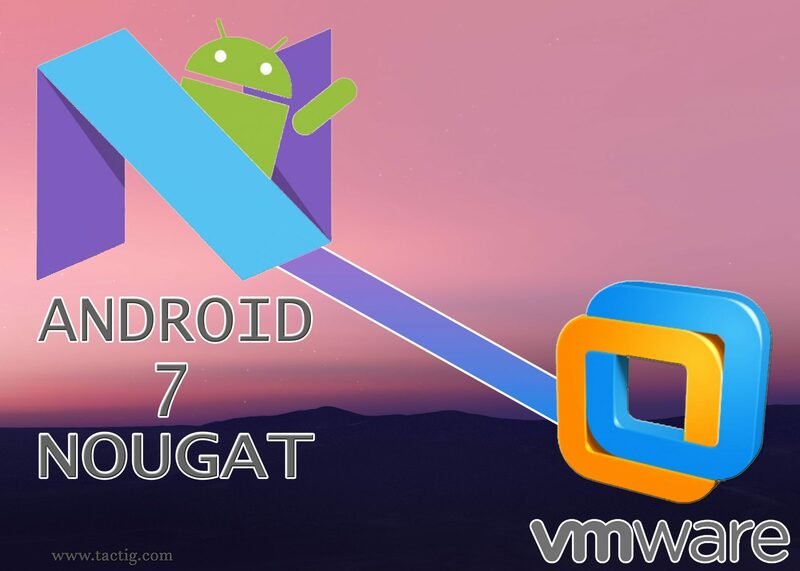 Note: This app/service work for all Computer, Android, iOS devices. 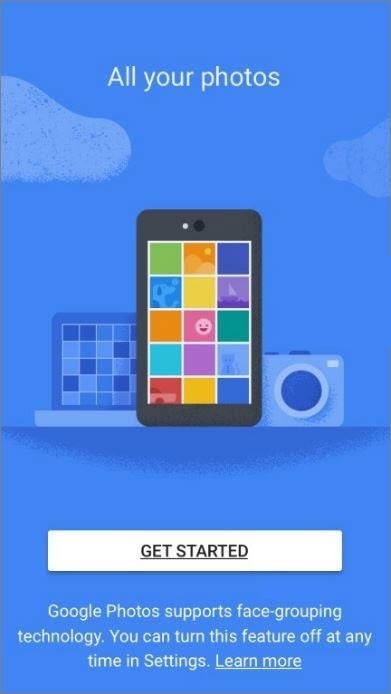 Introducing, Google Photos – a complete cloud backup solution, which allows you to manage & save photos and videos in unlimited cloud storage. The procedure of saving photos and videos will be done automatically ones captured or will capture in future. Also, it manages them quickly based on their faces, location, whats in the picture. Want them private? No worries, nothing will be shared anywhere, anytime unless you would like to. 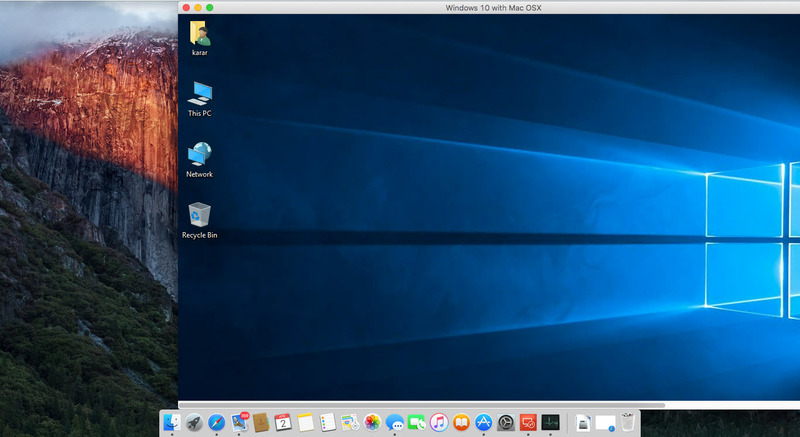 Moreover, it will cost you nothing if you choose the high-quality (free unlimited storage) option which is the best option. However, you’ve two options to choose. 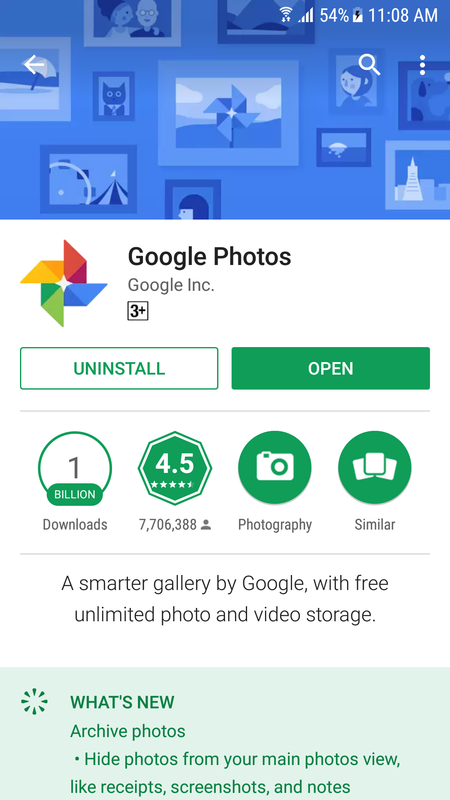 The Google Photos upload and works automatically once installed. Just sign in with your Google account and you’ll get started. 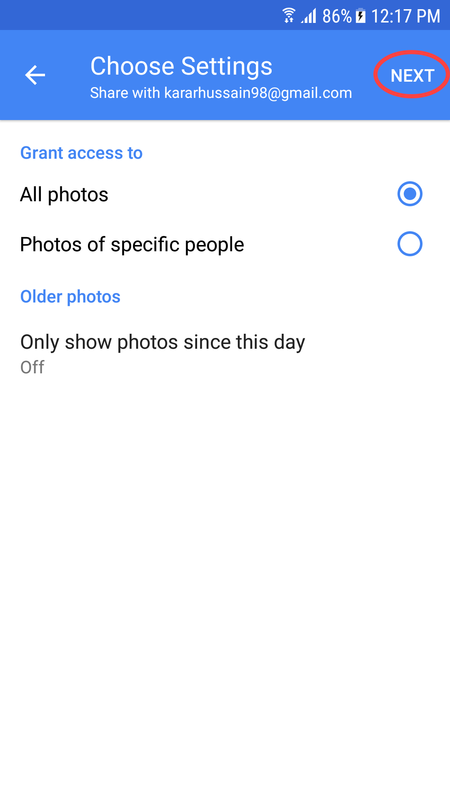 For using Google Photos, you’ll need to plan for one of the following. High Quality: Unlimited free storage for photos and videos that reduce the size and resolution of pictures to 16MP and videos to 1080P. 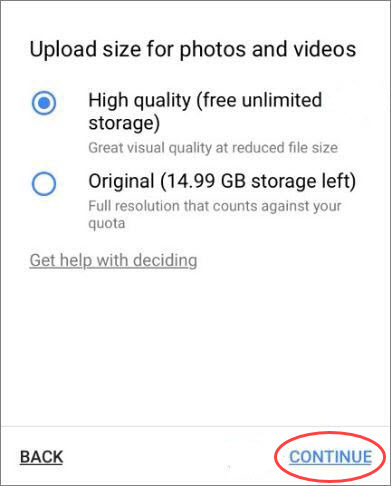 For, e.g., if you’ll have a picture above 16MP, it will upload to Google Photos and will be reduced to 16MP if you had chosen the High-Quality option, same applies to videos. I recommend this option if you don’t have more than 16MP means you’re using the phone camera to capture. 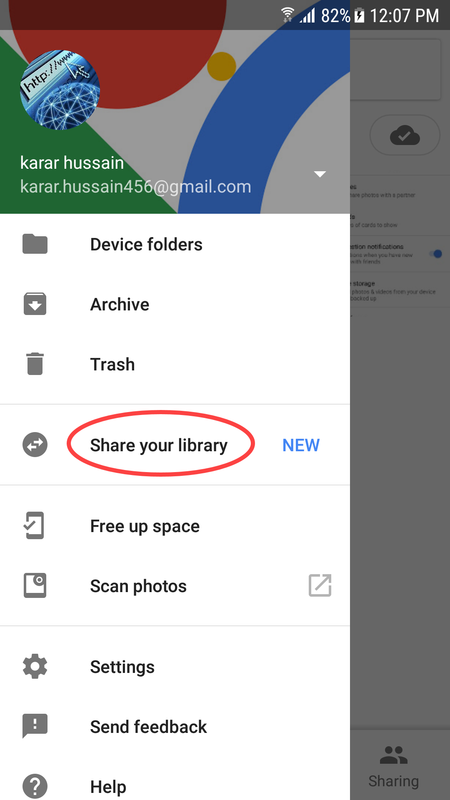 Original Quality: Limited free storage that uses Google Drive storage in your Google Account. All photos and videos are stored in the same resolution that you took them. 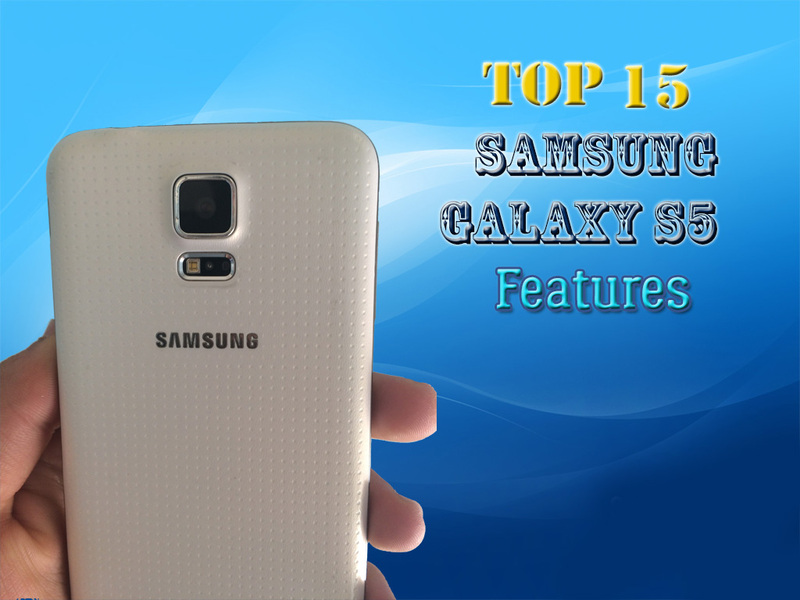 It is recommended for photos that have more than 16MP and videos with more than 1080p. 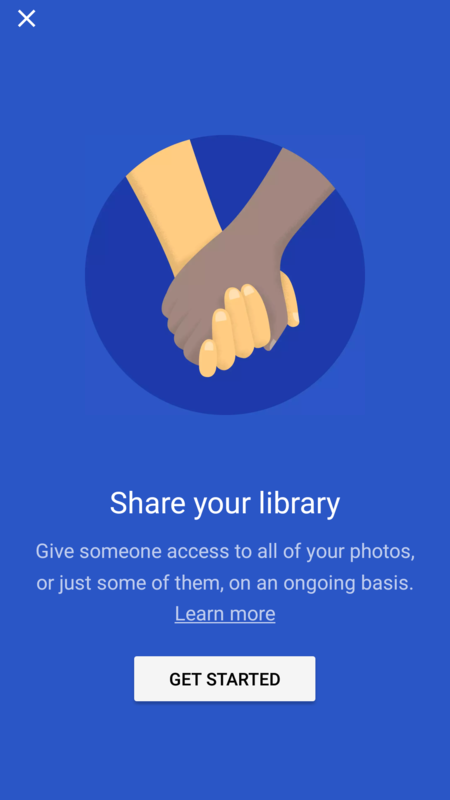 A Google Account and the Google Photos app on your Android or iOS device and on your PC or Mac, you can go to the website or just download the Backup & Sync app which is recently came to the internet. Want to remove a content? Find out how to omit. If you delete a photo or video from Google Drive or Google Photos, it won’t be removed from your computer. If you remove a photo or video from your computer, it won’t be removed from Google Drive or Google Photos. Once removed, it will be in the trash, and you can restore it within 30 days. It means if you’ve removed an item accidentally or something like that so you can bring it back from there after a long time. The photos & videos are the major part of the content, don’t want to lose them? Let’s start saving them and get rid of counting storage from your phone because you’ve unlimited storage just beside your phone storage. 1. 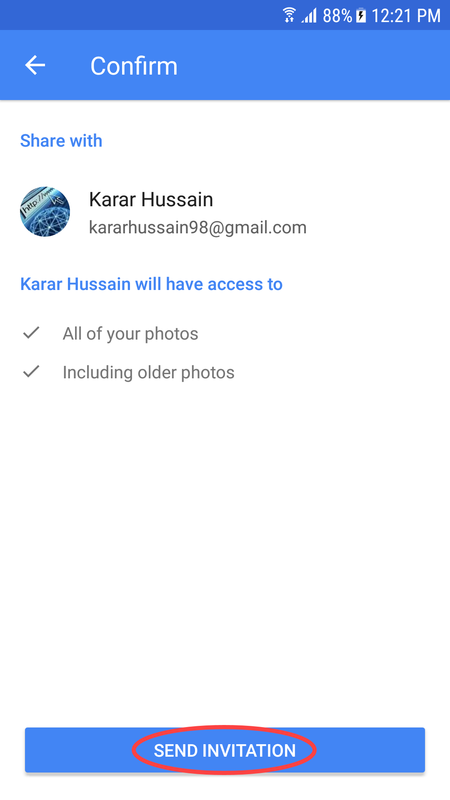 Open Google Photos or if you don’t have click here and install it on your phone. 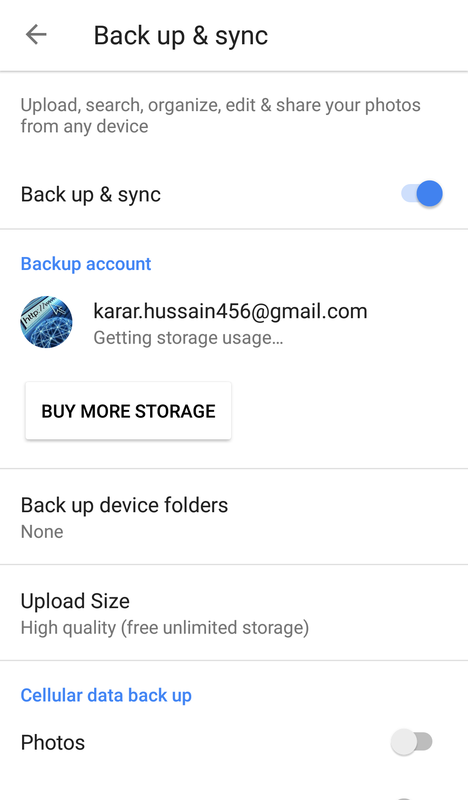 Note: You can install and use Google Backup on any device you want. 2. Now open it and sign in with your Google Account, if you don’t have a Google Account then click here and sign up. Once you’ve signed in, click Get Started. 3. Select Backup & sync and click Continue. Also, if you’re taking pictures with your phone, then this is the best option. And you are done! Now you’ll see the files will start backing up automatically if you wish to do some settings, so just navigate to the top left-hand side and click on the three lines and will see the options, select Settings, and you’ll be on the settings page. Also, those pictures change your plan and do some advanced settings for backup, tap Backup & Sync, and you’ll be there. You’re all set, now there are no chances to worry about your media contents because you’re backup every time. All of your contents including screenshots, Messenger, Viber, and much more are backup if you enable. Now you can take pictures without worrying about space, backing, managing and sharing because they are all done automatically once connected to the internet. The same applies to access; you can access them from any device you want. Want to share it with someone, don’t know how to do? See below. 1. 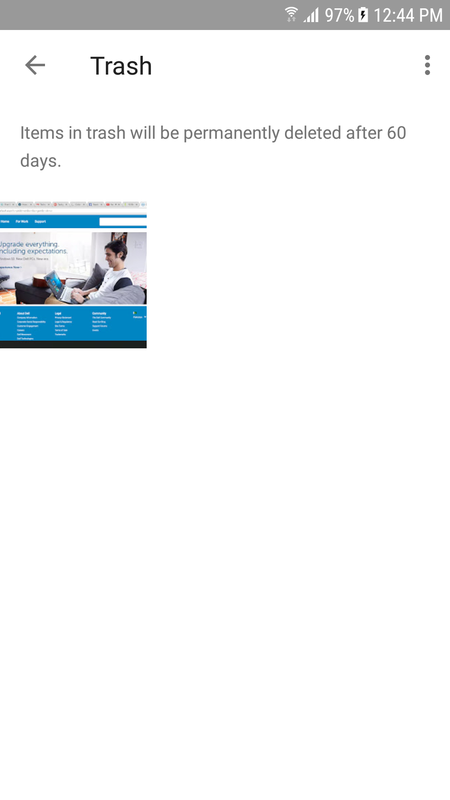 Navigate to the top left corner and click on the three lines and select Share your library. 3. Select one or more person or type down the email address you want to share. 4. Now choose whether you want to share all photos or specific one also you can select how long he can access it like a shot. 5. 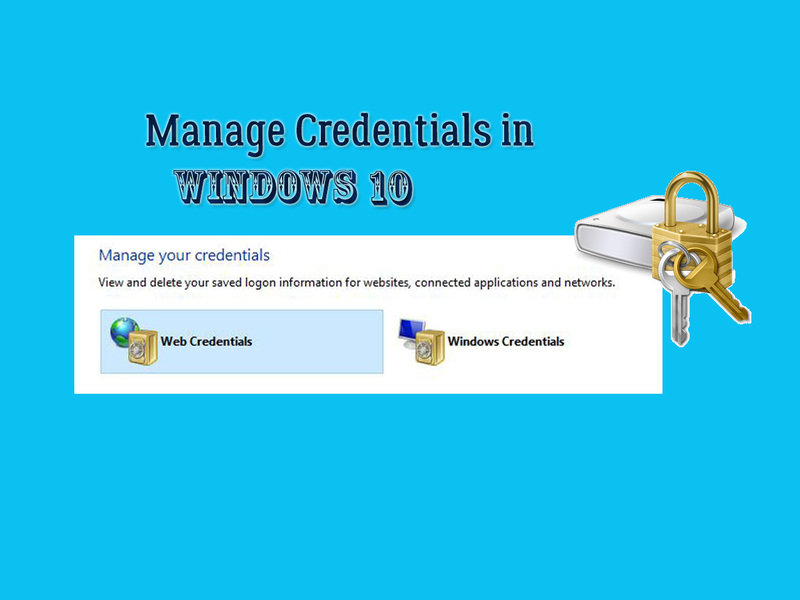 On this page, confirm what settings you have done and hit Send invitation so the user should be notified about and start accessing photos, you’ve shared with. That’s all. 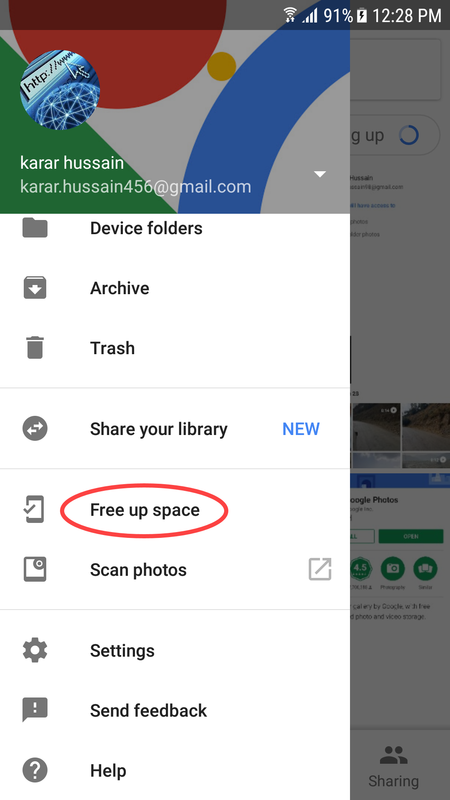 Hope you have learned and find out something new and remember when you have backup all of your content then don’t forget to free up space on your phone by pushing the Free up space button. 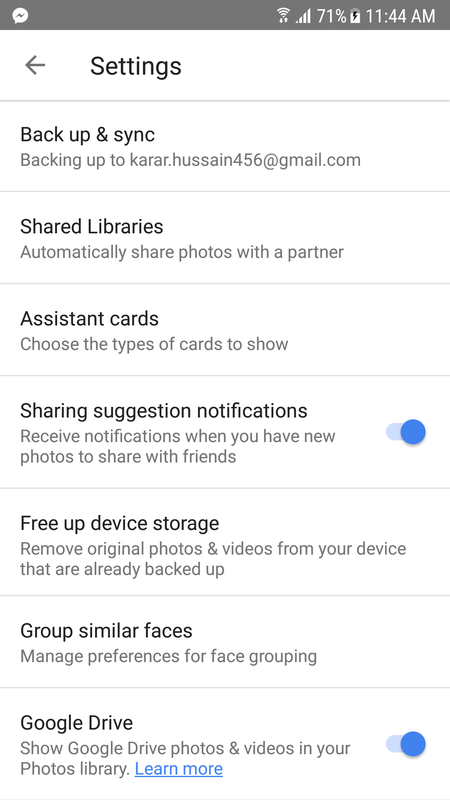 Note: The Google Photos will remove those items which are backup in Photos and will just expand storage by deleting those photos which are already backed up. Go to menu and select Free up space. Hit Remove and all the photos that are backed up will be removed. 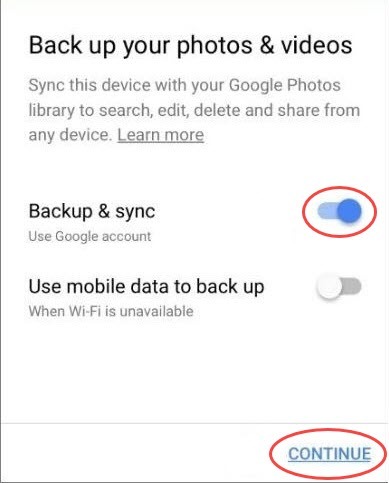 Remember, if Google Photos have backup all of your photos and videos, in that case, it will remove all of your photos and videos from your phone. 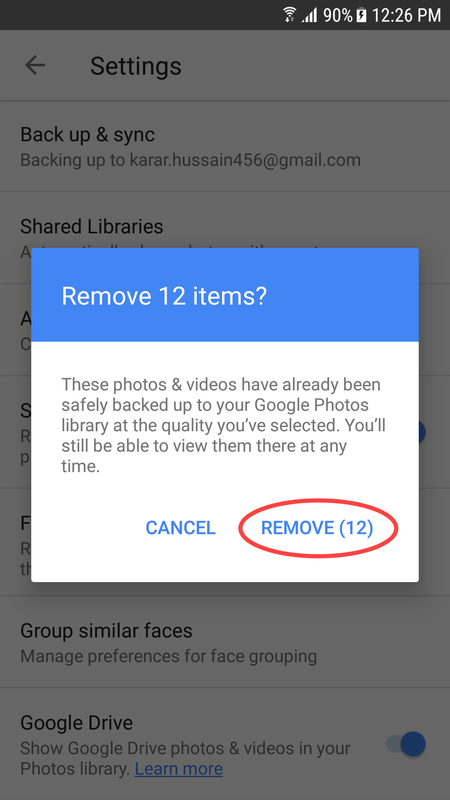 One thing else, if you delete an item from Photos, it will be omitted from Google Drive too, but it won’t be removed from your device. Despite deleting it from Photos if you want to recover those then it’s pretty easy, no need to worry, just head up to Menu>Trash. 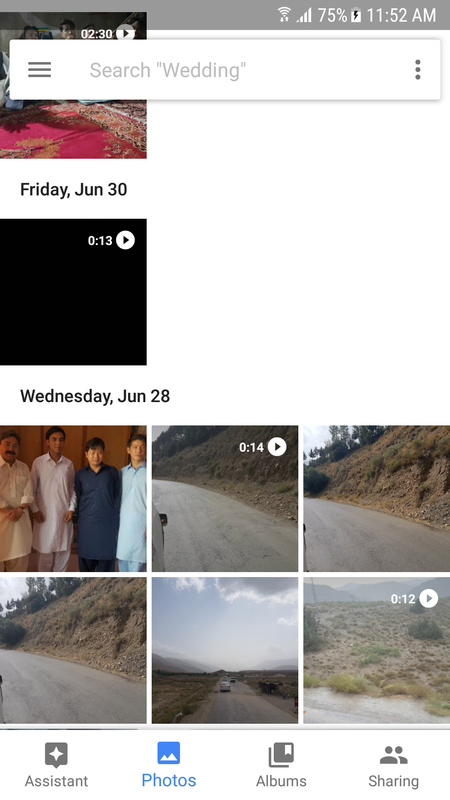 Here you can see all the photos deleted recently or from past, the photos will be deleted from the trash after 60 days.